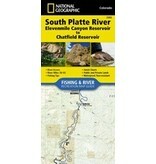 Waterproof • Tear-Resistant • Fishing & River Map The South Platte River, Elevenmile Canyon Reservoir to Chatfield Reservoir Fishing & River Map Guide is designed to be the perfect companion to anyone recreating on the South Platte from just below Elevenmile Canyon Reservoir to the southwestern suburbs of Denver. The South Platte below Elevenmile is dramatically different than flat meandering flow found upstream. Almost immediately it enters a series of steep canyons and recreation areas managed by the Pike National Forest before existing the Front Range at Waterton Canyon. Each Fishing & River Map Guide includes detailed river maps at a scale of 1 inch = 1/2 mile. At this scale every turn in the river and rapid is clearly shown and labeled. Each page is centered on the river and overlaps with the adjacent pages so finding any location along the river is easy. The maps include river miles, access points, private and public lands, gaging stations, recreation sites, and more. Pat Dorsey, one of Colorado's most renowned fly fishing guides and authors, has written the introduction as well as descriptions of specific fly fishing strategies and seasonal fluctuations found on the river. Also included are stream flow charts, hatch charts, and a table of river access points. More convenient and easier to use than folded maps, but just as compact and lightweight, National Geographic's Fishing & River Map Guide booklets are printed on "Backcountry Tough" waterproof, tear-resistant paper with stainless steel staples. A full UTM grid is printed on the map to aid with GPS navigation.